After Orville Breeveld got some time to get used to his new electric guitar, there was recently a moment to do a re-setup on the instrument and to make some pictures for the website. The setup was no unnecessary thing – the first thing Orville did was to ship the fresh instrument to Indonesia and do recordings and gigs there. For all of you people who own a Vigier guitar and get nuts from the output getting loose all the time. For this particulair guitar it is very hard to tighten the jack again. Here is a simple modification. 1. This output is used standard in the guitar. It is a Switchcraft tube jack that can be only tighten from the inside of the guitar. And there, in the electronic cavety there is no space to use standard wrenches or plyers. If you are not careful you ruin the thread and have to drill out the complete jack. 2. I replace them by a Switchcraft tube jack that is used for acoustic guitars, the ones that are output and strap holder. 3. I remove the strap holder washer and just fit the tube in the guitar. It now can be tighten from the outside with a regular 13mm pipe wrench, although you want to hold it from the inside to not twist and loose your electronic connections. It might not look THAT pretty; it is very practical, and to connect the cable is really no problem. 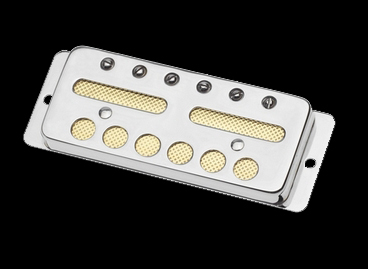 Lollar Goild Foil pickups are in stock now! I now stock Jason Lollar’s take on the legendary Gold Foil pickup. Hyped by Ray Cooder, Jason already started to produce a Supro Steel pickup, now you can complete your “Coodercaster” with a Gold Foil neck pickup… Or just buy a bridge – neck set. Or just buy a three pickup set with RWRP middle pickup to make a Gold Foil Strat! Jason’s pickup is made as a very sturdy, long lasting pickup; it does not have the microphonic feature like the original. Shims are available that matches the bottom plate of the pickup, to adjust the height, like a P90 dogear. A version to screw directly on the body (photo), and a version with a side mounting plate to connnect to a scratch plate and float on the top are available, nickel and gold. All variations can be ordered. One of the first questions we get asked when we meet guitar pickers is – “Do you make Gold Foil pickups”?. Well, we finally took the hint, and spent the time (two years of R&D) to get it right. We use custom made parts, built to our specs. We hand stamp the foil inserts, one at a time – even the rivets holding the pickup together are custom made. As with all the pickups we make, every aspect of the design has been scrutinized and tested – to sound right and last a lifetime. 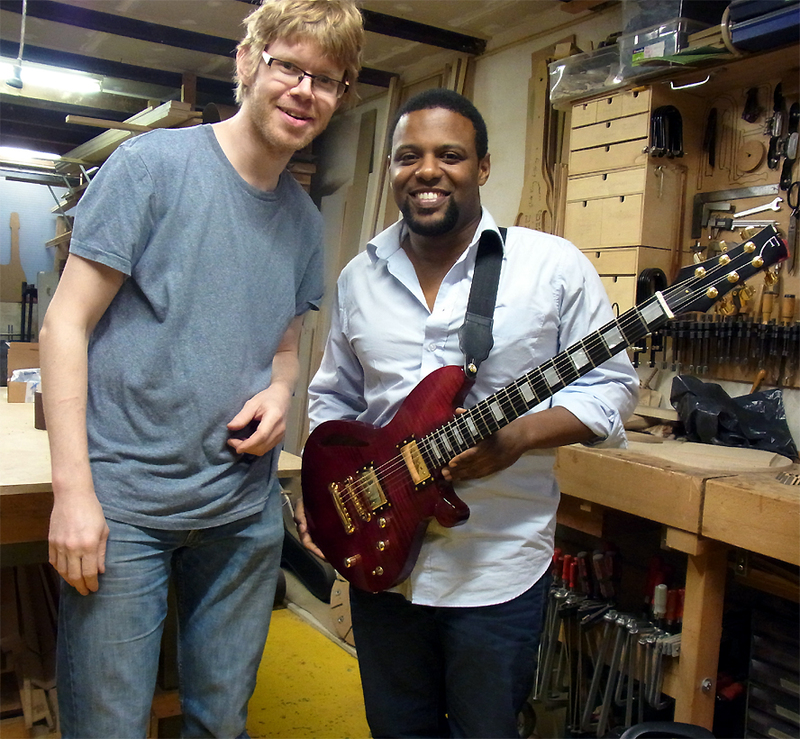 After a year of developing, talking, sketching and carving, Amsterdam leading session guitarist Orville Breeveld was yesterday finally able to lay his hands on his own signature guitar. He became a quiet man, and surprised with an instrumental version of a Marco Borsato song that could easily fit any jazz album. As a starting point I took measurements from his old Ibanez AM400, and adapted them into my Custom-1 guitar. 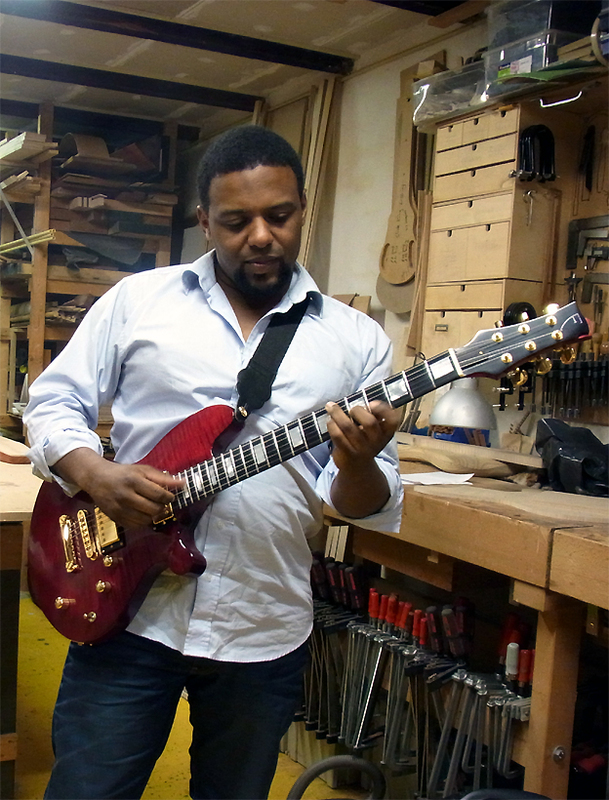 We decided to do a semi-hollow guitar, with a focus on the sound of a solid body guitar. The semi-hollow construction would add a nice brightness or “ring” to the instrument. Most specs from the neck of the Ibanez were copied in the new guitar (thickness, width, shape), and the guitar was redesigned around a 24 9/16″ scale length. The shape was comfortable for Orville, but the F-hole on the bass side should be a bit more modern, and can we do a wine-red finish? Orville told me one of his earliest connections to the guitar was the Gibson Marauder in wine red that his father used to play. 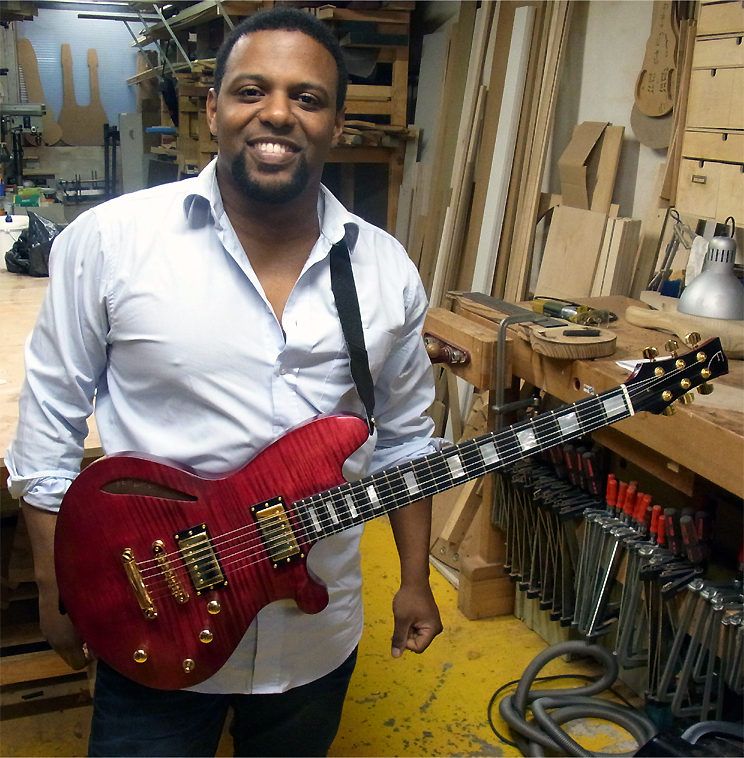 We finished the design with adding a pearl block inlay in the neck and gold plated hardware. Orville first gets a moment to PLAY the guitar, in December the website will be updated with a more photo’s and information. As a musician, composer, orchestrator, teacher and marketeer, Orville Breeveld has been working in the field of international art, entertainment, media and advertising for over a decade. With a cosmopolitic vision, Orville Breeveld has set stage for various multi-cultural artistic and as well as business talents throughout Amsterdam. As a musician and composer, Orville Breeveld has a long established career of working together with various ensembles, musicians and entertainment corporations through out the world like Nederlands Blazers Ensemble (Dutch Horn Ensemble), The Metropole Orchestra, Maher Zain, Combattimento Consort Amsterdam, Karsu and many others. With his own event production company and talent development organisation Breathing he has been presented and programmed hundreds of young talented singers, bands and visual artists on international festivals and events. Besides composing and arranging for his own bands Orville composes music for TV, radio and other artists. This he does with his own company The Groove Group. Orville aswell is a proud father and has a strong vision on fatherhood in various communities. He initiated the platform Vitamine V in the Netherlands to inspire other fathers and to contribute to a better upbringing of children through various actions and activities.